Winter seems to have been on break today because the weather was amazing! With the sun on our backs we drove out onto a very calm ocean and made our way towards Dangerpoint. A couple minutes later we passed a trio of penguins who weren’t at all skittish of the boat and kept popping their heads up. 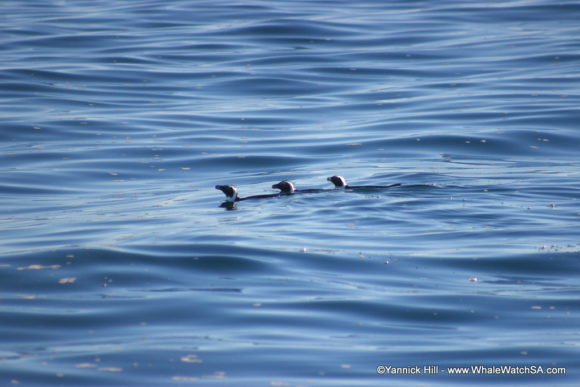 Soon after, we spotted our second sighting, and what a sight it was! 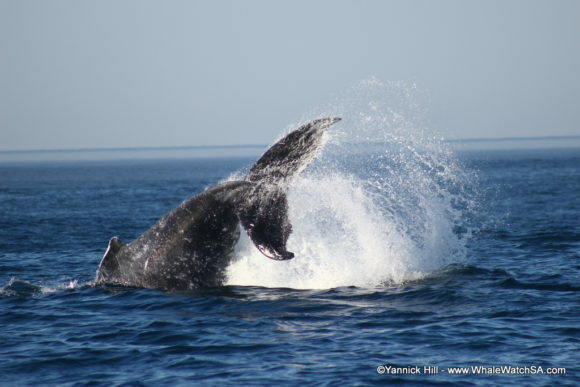 Two very active humpback whales breaching, playing together and offering us an amazing time. They even kept following us as we started to leave as if they wanted to play some more. On our way to Dyer Island we spotted a couple more humpbacks but since they kept moving we continued towards the island. Our 60,000 strong seal colony welcomed us at their rock with even more of them in the water then usual, due to the warm weather. Some were very curious of the boat and came close, offering us the possibility to take some great pictures. We made our way past Dyer Island in search of some penguins, but they seemed to have taken refuge of the sun in their nests. During our stop at our sister company Marine Dynamics we anticipated meeting the mighty Great White Shark but sadly we had to move on. Although, the ride back to the harbour, close to the coast, with such amazing weather made up for it! For our second trip, we went out at sea searching for the Marine Big 5 not knowing about the magical moments that were about to come our way. 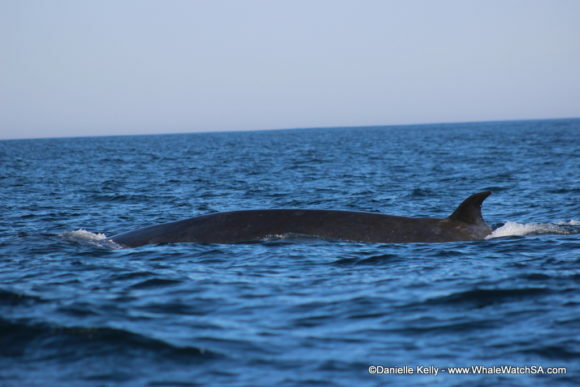 First, we spotted a spout and as we moved closer we found ourselves with a Brydes Whale. The whale was calm but quite curious as it approached us showing us his prominent hooked dorsal fin, a distinguishing feature of these animals. 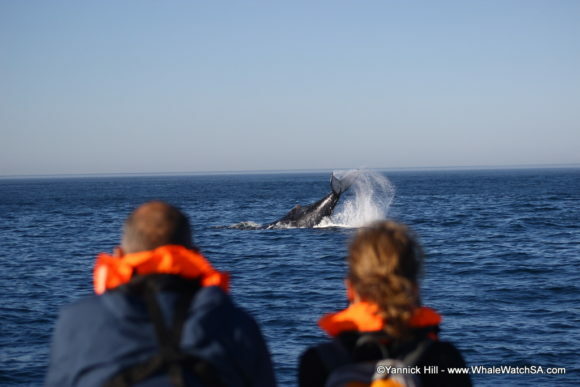 Soon after, we spotted another spout and realized we had found 4 Humpback Whales. we stopped the boat and were looking around for where they may be. Next thing we knew, a large shadow was approaching us from under water and we discovered these humpbacks were right below us. They continued to stay around our boat leaving both clients and crew in absolute awe as we got a once in a life time close up of these beautiful, giant creatures. The Humpbacks went out a little further putting on a show as they were playing in kelp. Still astonished by being face to face with a Humpback Whale we waved goodbye and left them to play. 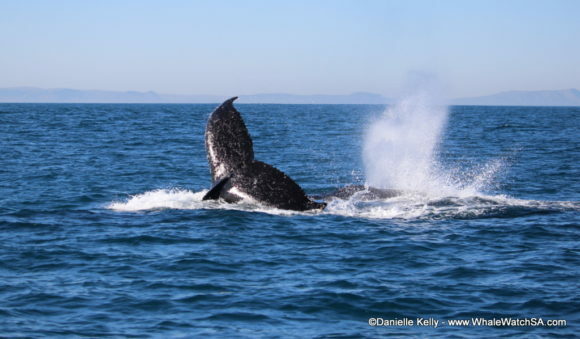 It was only minutes until we spotted our next group of 4 Humpbacks, and did they ever put on a show for us. 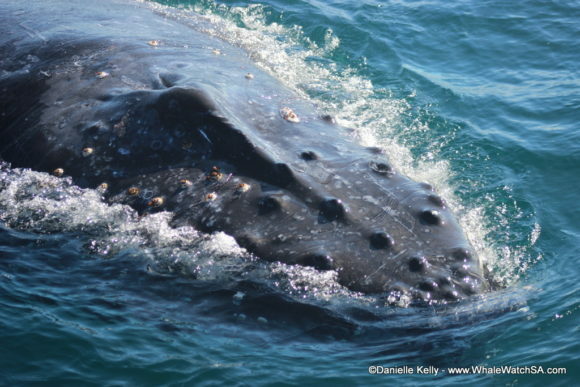 Everyone’s jaws dropped when the Whales started breaching and tail slapping over and over again. As much as we wished that we could stay there forever, we knew there was more to be seen. 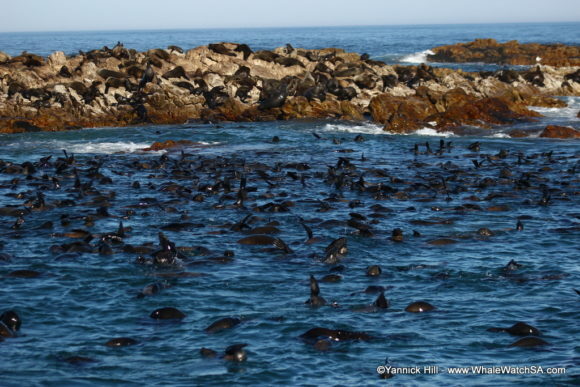 We headed over to Geyser Rock to see our colony of 60,000 Cape Fur Seals. These guys never fail to entertain as they play in the water. Next stop was to our cage diving sight, during our travels we spotted two groups of the rare African Penguin. When we reached our cage divers, we were lucky enough to catch a glimpse of a curious White Shark circle around us. This was our last stop for the day, we then headed back to the harbour in bliss, excited to share our unforgettable experience with others back at shore.